Eat The Goat. . . .
Sunday in Africa. . . . and by the end of the day, Sunday’s will never be the same! We get up early for a ride out of Nairobi and into Kenya’s Rift Valley. This time, however, our group doesn’t load up in vans as we’ve done all week. We’re climbing into four-wheel-drive Toyota Four-Runners. By the end of our three-plus hour ride to church we know why. The first two hours were spent on roads. The last hour-and-a-half was spent more-or-less driving through fields. How we found our way, I’ll never know. But it was an awesome experience getting there. 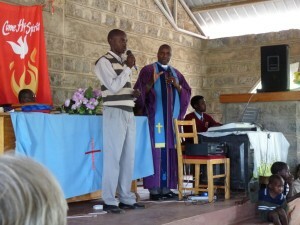 “There” was a Masai village and church in Nagile. I don’t know if Nagile is on the map, but we found it. The time spent driving through the fields was incredible. There was wildlife everywhere. As we would pass the occasional tiny Masai village or single hut happy children would come running out to the “road” waving happily as we passed by. 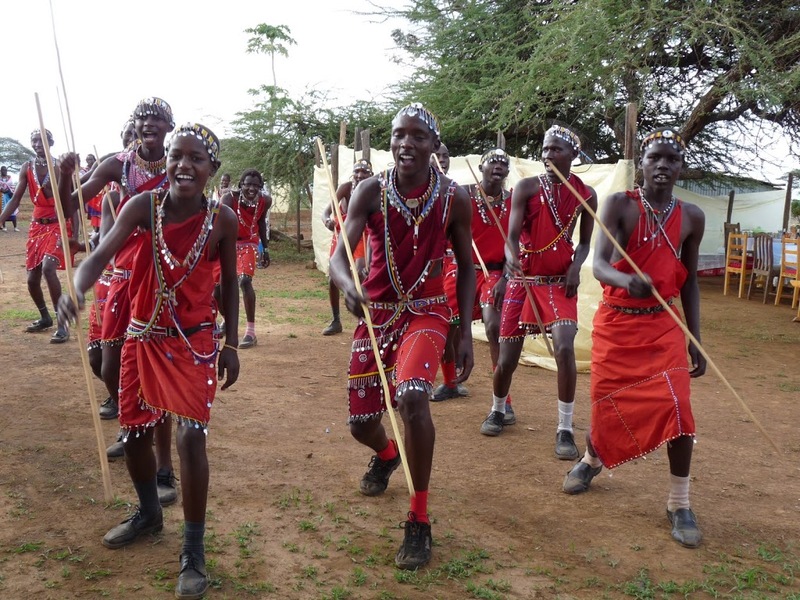 All along the way we saw Masai men, women, and children dressed up and walking. The men were in western clothes. The women wore colorful traditional Masai dress. They were walking to church. . . some, we found out, walked for hours and miles. A four-hour walk is not unheard of. Wow. As we arrived in Nagile, we saw evidence of Compassion’s great work. Two boarding schools – one for girls and one for boys – stood out on the flat ground of the valley. In addition, there was the church where we were going to worship. As we pulled in, small groups of happy children who had been patiently awaiting the arrival of our pale-colored group ran to meet us. It was like a homecoming. But in the midst of all the greetings, most of us were somewhat drawn to the skinned carcasses hanging in a tree. 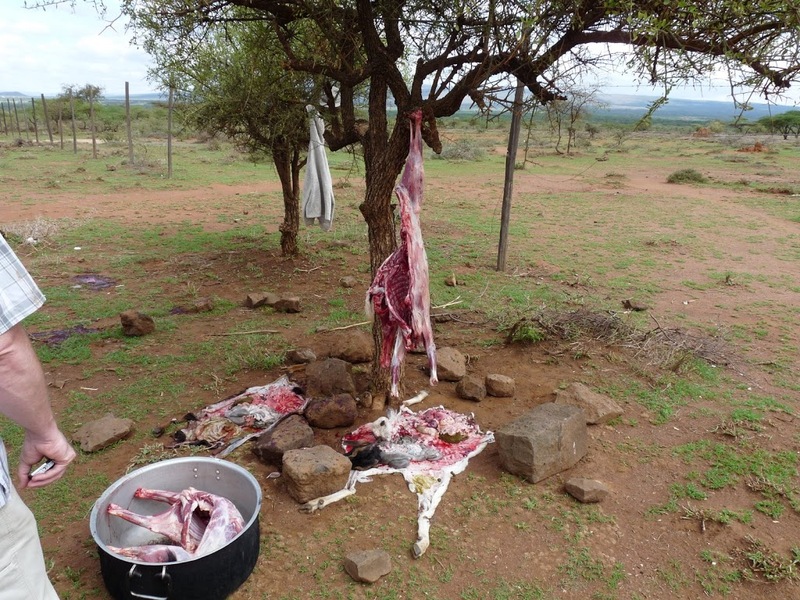 A small group of Masai teen boys had just killed and skinned the goats. We knew we were looking at lunch. Lois Penner told Lisa that she hoped the service would be long. That way our lunch would be sure to be well-done. After lots of greetings and conversations with kids. We headed towards worship. 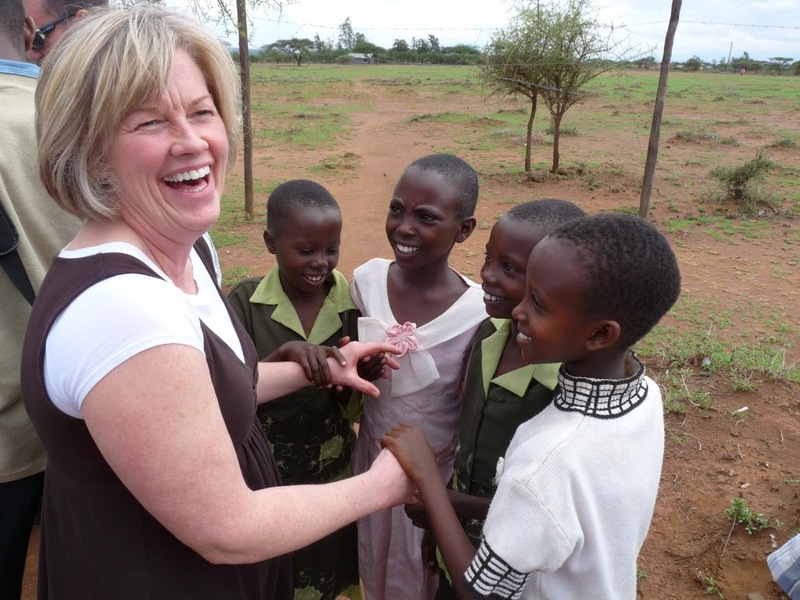 On the way, a group of four young girls walked hand-in-hand with Lisa. . . they couldn’t stop looking at her white skin and blond hair. 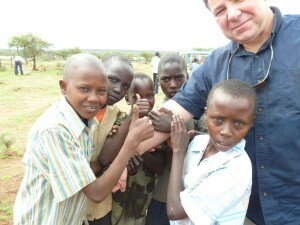 In an amazing gesture, one of the girls slipped a Masai bracelet off her own arm and onto Lisa’s wrist. A gift. These people are incredibly giving. And so we go to church. Worship is a four-hour experience with numerous choirs, a congregation that grew by the minute and eventually ended up with about 600 people in the warm building, and some spirited preaching. Because we were coming, numerous other guests from the area showed up to welcome us. I was blown away by what we saw and experienced in worship. These people love Jesus deeply. They are very family oriented. There’s no children’s church or separate youth worship. It’s everyone together. . . . as it should be. We sing, we dance, we get called forward to help dedicate a new sound system. Oh, and by the way, we get asked to perform a little number for the congregation. Due to our collective lack of musical ability, we quickly decide to sing the old youth group response song, “King Jesus Is All.” Chap and Duffy are elected to lead. We get into it. . . . doing our best Southern Black Gospel imitations. The looks on the faces in the congregation are priceless. It is as if they are in shock. I’m not sure what they were thinking, but I’m guessing that if we ever have the chance to go back and worship with these folks again, they’ll be happy if we keep our seats! 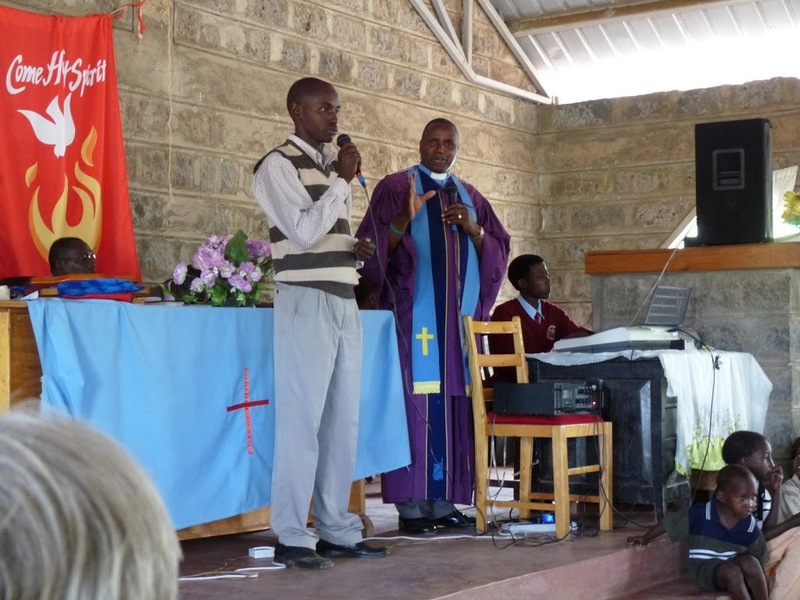 With worship over, I know that next time my own pastor prays for those brothers and sisters worshipping around the globe, it’s this Masai congregation that will come to mind. After greeting literally every member of the congregation, we head to lunch. . . . nervously. And we eat, graciously. 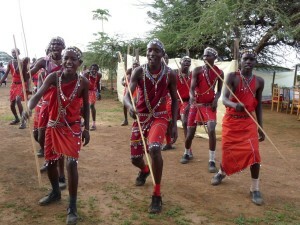 Lunch is followed by the Masai warrior dance team from the boys’ school. They are national champions, and they are good. It is fascinating. We mix and mingle with members of the congregation and hear about how Compassion is changing lives in this small congregation. We visit the newly built and dedicated girls’ school. The girls are so excited to show us around. They are thrilled with the opportunity to get an education. . . something that would not be an option without the presence of Compassion and the gifts of Compassion sponsors. We head home, hoping that we make it back to the real road before dark. We do. My neck is totally stiff from the ride. My heart is warmed by what I’ve experienced during the day. It was rich. . . very rich. The Kingdom of God is truly much, much bigger than any of us can imagine. The brand of Christianity that we value here in America is nowhere near as deep as we imagine. Again, we have a great day. 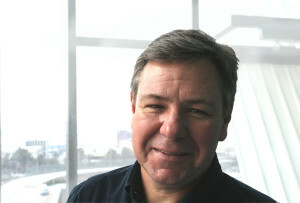 Our knowledge of Compassion grows and our understanding of the impact of their work is deepened. I won’t forget the faces on the folks at the Masai church in Nagile. 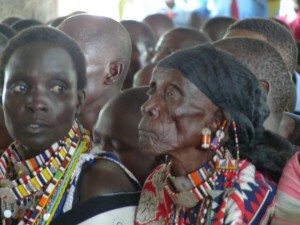 Most memorable is the elegant face of the elderly Masai women who sits near me in the front row. And tomorrow we get to see the face we’re most excited to see. We’re heading to the Mathare slum to meet our sponsored Compassion child, Ibrahim. ← Is This Thing Working? . . . .